A pocket diary with random playing cards written against each date is tossed out to 8 participants in the audience, one after the other. 4 of those participants declare their dates of birth but either tell a complete lie or complete truth or half truth or half lie about their respective assigned playing cards. But the performer accurately divines their cards in spite of all the half truths or lies. Now the other 4 participants are asked NOT to divulge either their dates of birth or their respective assigned playing cards. And yet, very impossibly, the performer accurately reveals all their cards. Only one diary is used with a onetime preparation. It can be any type of normal pocket diary. There is absolutely no arts and crafts involved. Just the writing down of different playing cards against all the dates in the diary. Although knowing a stack like the Karma Deck (or any other stack) will be useful, it is not necessary at all. Once prepared, this same diary can also be used for close up performances. Importantly, no physical playing cards are used in this routine – whether normal or jumbo – in both the stage and close up performances. Even a beginner can easily prepare this diary and comfortably perform the routines. No sleights, no stooges, no preshow. Once prepared, the diary should last you many many performances, in spite of the usual wear and tear. There is also a huge scope to engage audience members with individual cartomancy readings after the show, if the performer is so inclined. I compliment THE UNKNOWN MENTALIST with another GREAT 20+ EFFECT!!! It takes some time in preparing the pocket calendar but it is really simple after you go through a couple of months. I set my calendar up with the SLOKA deck stack myself. I used the random suit stack with it to help make it even more deceptive. If you don't have this stack...BUY IT! You could use this effect close up with two, three, or four spectators but I think I will prefer using just one. After I explain TIME and SPACE to the spectator and finding out which they are I will proceed with the effect from that point. After I pick up the playing card telepathically I will tell the spectator what the playing card means (Except for the Ace of Spades, the death card. I will make up my own personally meaning for it. You can also say that this is the spectators lucky playing card and give the spectator some cold reading statements and even add in information about their zodiac sign also. This effect can be another reputation maker!!! By the way, I have a playing card reading book at home but I'm sure you could find something about playing card meanings and lucky cards and also cold reading at Lybrary.com or on the internet. I like this. Already prepared my diary - took about 45 mins. Packs multiple punches. What I like most is flexibility - great for both stage n close up. For stage a multi phase act with about 7-8 audience members is given. Builds up nicely to a big climax. And close up also can be done for 2 or 3 persons. Best part is there is only one diary and that too fully examinable (not that anyone would want to examine). Although knowing any stack can be an advantage from presentation angle, an easy method included even if you don't know any stack. In fact, after a first read, a found that a stack is not needed at all and any random sequence of cards can be used. Any type of diary/date book can be used. The combo of methods is clean and self working, well almost. Importantly, the presentation and theme given is interesting, clever and novel - blends well for the routine and methods. Like my earlier purchases of this author, happy with this one too. For many many years now (after performing it over a 100 times), I had always held Bob Cassidy's chronologue as a benchmark in diary effects - and for good reason. 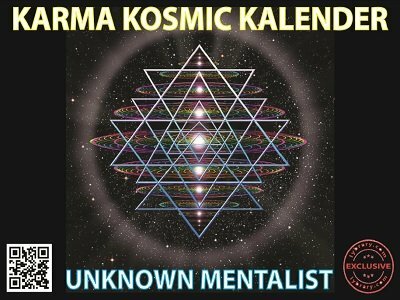 But now for me Karma Kosmic Kalendar will be the new benchmark in diary effects. That's saying a lot. Because it is that good. This will now replace Chronologue both in my jacket pocket and in my act - both stage n close up. Need I say anything more? That pretty much sums up my review, I guess. Very versatile diary. A favorable effort benefit ratio for the work put in to the diary. I'm in the process of making up mine with a small pocket diary. Good that there is just a single diary to make up and the same can be used for both close up and stage. The phases are structured in an increasingly impossible manner and build up to a nice climax. With just this diary in my clutch, I now have a killer close up as well as a stage act always ready to go. As usual, some great thinking by the author. The theme and presentation suggested is extraordinary. Although it revolves around playing cards, I like the fact that none are actually used. The methods are interwoven to be magician foolers.